Learn how to take advantage of ESP (English for Specific Purposes) Legal English. English is the global language for all aspects of international communication and used extensively in the legal field. Take advantage of this lucrative highly specialised teaching field. Detailing legal systems, international law and Australian law systems. Teaching Legal English covers what the professional English teacher needs to know in order to teach in this specialised area. Covering court systems, tribunals, systems of government, mediation and arbitration, contracts and legal documents this course will thoroughly prepare you for legal English teaching. Legal English not only covers the necessary topics and information but also contains comprehensive information on course content, teaching methods and legal vocabulary. 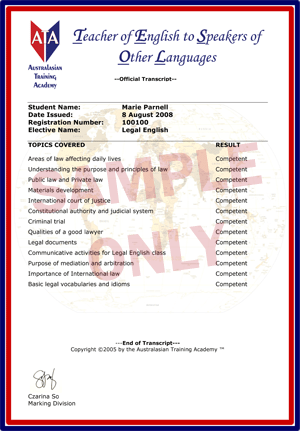 Q: I do not have qualifications in the legal field, how will I teach Legal English? A: Legal English contains everything the TESOL teacher needs to teach in this exciting field, remember you are not teaching your students their profession but providing them with the opportunity to use what they know in the English language. Q: Where do I find resources for Legal English? A: This course is full of ready to use activities, vocabulary and resources plus ideas on how to create your own.